BPSC Main Exam Date 2016 – Bihar 56th to 59th Common Combined (Main) Competitive Exam to starts from 07 July 2016: BPSC 56-59 Main Exam Date announced. Bihar Public Service Commission (BPSC) is all set to conducting Bihar PSC 56th-59th Common Combined (Main) Competitive Examination 2016. They have already invited BPSC Main online application from Preliminary passed candidates for filling up 737 vacancies. As BPSC 56-59 Main exam is commencing from 07-07-2016, here is everything candidates should know about BPSC 56th-59th Main exam 2016. BPSC Mains exam date is likely to be changed. Stay tuned. When BPSC 56-59 Main Exam will be held? This is questions BPSC Pre exam qualified candidates are asking regularly. Finally good news for them, BPSC officially announced 56th-59th Main examination date. As per the news, BPSC Main (Descriptive) examination will be conducted from 11 July onwards. Candidates are hereby recommended to keep preparing for main exam. As it is mentioned in the above notification that Admit Card will be available for download from 27th June only and it is 3rd July and no information about BPSC Mains Admit card. 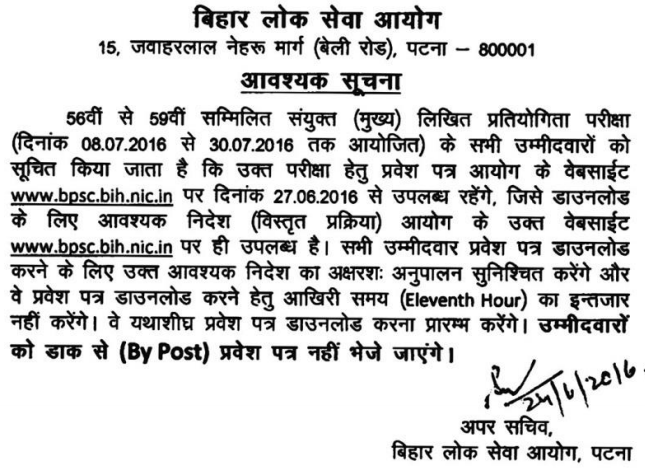 This indicates the Commission is going to change BPSC Mains exam date. More Details: Candidates are advised to be in touch with W3i.iN, we are here posting more detailed information about BPSC Bihar 56th to 59th Common Combined (Main) Competitive Examination 2016.